Who Gives A Crap? Us! Just when you thought we couldn’t get any more eco-friendly. This one even surprised us. Lets talk about the delicate issue of toilet paper. Not a clean subject, but a valid one. It’s an item that we take for granted, but it’s been bleached, most of it isn’t recycled, and it can become landfill. 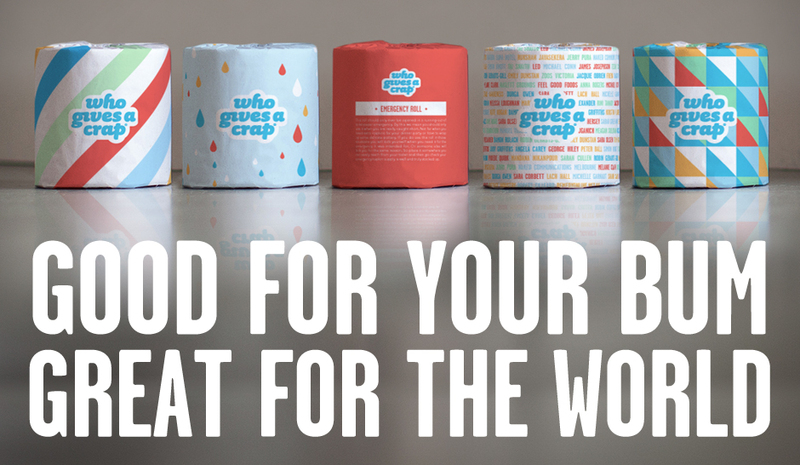 We have just got on to a company charmingly named “Who Gives A Crap”. This ingenious company takes an item that we see as a bare necessity, and creates a company based around turning it into an environmentally friendly concept, and helps people! This new toilet paper is 100% post consumer recycled, unbleached,and most importantly 50% of all profits are donated to bring clean water to underprivileged communities. (and it’s soft, unlike other recycled options). Pretty cool isnt it? We have made the change, and suggest you look into it too, with their handy subscription service, and free postage. Saving the world, one wipe at a time! We often get asked loads of questions about hair, our team, and how we operate. We thought it would be a good idea to put together a few frequently asked Cobaarz questions! 1: Are your colours natural? In a word, yes. We use only Aveda products and colours at Cobaarz, so you can be assured that we are using a natural alternative. Aveda works by replacing toxic chemicals found in traditional colours and products with plant-based alternatives. And at 96-99% naturally derived, they are super effective too. All of our team uses only Aveda in their skincare, makeup, and hair care routines, so we feel the difference ourselves. 2: How much is a ladies haircut at Cobaarz? Our haircut prices vary. We have a tiered pricing structure, based on several things. The stylist’s years of experience, level of guest demand, and awards won all come into play. It also varies depending if you wish to have a blow wave, or choose not to. If you have particularly challenging hair, you may want to book in for our Director or Advanced Stylist, but we can assure you that our Senior Stylists and New Talent levels are very well trained too, and we guarantee you will have a fantastic experience with them too. All of our haircuts include a shampoo, complimentary ritual (Your choice of a scalp, neck and shoulder massage, mini-facial, hand spa, or make up retouch! ), and a beverage from our barista-style coffee bar. We are more than happy to include a styling lesson, free of cost. Our haircuts range between $50 and $74. 3: How much do colours cost? At Cobaarz we firmly believe in getting what you pay for. We have a base price for colours, and you literally pay for any extra by the gram. Highlights come in packages of partial, half head, full head, and toners are sometimes required. We always offer an obligation-free quote at no cost for all colour guests, to ensure that you and your colourist are on the same page, both in the end result, maintenance factors, and the wallet. 4: How can I do GHD curls? Ah, that’s much easier than it seems! Book in for a blow wave and curl and we will teach you. Pair it with a complimentary make-up retouch and you’ll be ready to hit the town in no time. 5: Do you use bleach? No. With Aveda’s “Enlightener”, we believe that there is no longer a place for traditional bleach in salons. We can get the same (if not better) result without it. You’ll never look back. 6: How can I make my blow wave last longer? We have some secret weapons for you. The first is Aveda’s Style Prep Smoother. It has anti humidity agents in it. The second is Anti Humectant; as the name suggests it is all about keeping humidity away. The third is up to you- a silk pillow case is always a great way to prevent matting and tangles. Really, it works! 7: What else makes Cobaarz an “Eco Salon”? We try to do what we can to minimise our impact on the environment. We do this through our partnership with Aveda. Aveda also helps sustain indigenous communities and promotes organic farming, so by using only Aveda, this ripple effect is felt throughout the world. We use nifty “Eco Heads” on our basins, which minimise water use. Natural cleaning products are utilized in every way possible. Our lights are low energy use. We recycle EVERYTHING that possibly can be. Our coffee beans are organic, fair-trade and delicious. Even our paint contains lower amounts of volatile organic compounds, and we have used reclaimed materials wherever possible during the build of our salon. We have a very low carbon footprint, and are proud to say that we offset this annually. Yep, Carbon neutral! We walk the talk! 8: How can I get discounts at Cobaarz? We have a few ways to help you save money at Cobaarz. The first and most immediate is to sign up to our VIP List via the website. You get an INSTANT $20 voucher to use on ANY service. You also get first dibs on any packages and offers that we will run in the future, as we email them out a week before other means of advertising. Another easy way is to refer your friends. If they come in and let us know, you get sent a thank-you voucher for each friend that comes in. We also send all of our new guests a welcome pack, which also includes some more goodies. We like to reward those who help us out, so lets spread the love! 9: How do I know that you are up to date with the latest fashions and techniques? All team members must participate in fortnightly training nights run through the salon. The Cobaarz training programme ensures that everything is done our way. We have traveled interstate many times for additional expos, seminars, and training. Nicole has been to international events several times in order to bring it all back to the salon. We love hair so much that it dictates our holidays! On top of that, our team regularly visit Aveda H.Q for additional training. We go to learn each new seasonal collection, as well as product and hair fashion courses. In fact, Nicole and April are doing a high-level course to become as highly educated within Aveda as possible, a level only reached by a small amount of stylists in Australia. Nicole is training to become a part of the Aveda Education Team. We would like to assure you that you are in good hands! 10: Eek! My hair is falling out! Can you help? Probably. Aveda’s newest and most successful product line, Invati, is made to help minimise hair loss and promote hair growth. Best you come in for a complimentary consultation and Invati treatment and we can get you started on this new regime. We hope that this helps answer a few questions. If you have any more please feel free to come and visit us at any time. Don’t forget to sign as a VIP on our Website!